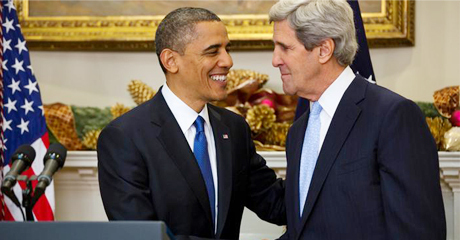 President Obama has announced he is nominating Massachusetts Senator John Kerry to be the next secretary of state. If confirmed by the U.S. Senate, Kerry will serve as America’s top diplomat during the Obama administration’s second term. The president announced his choice at the White House December 21, telling reporters that Kerry’s long public service career has already earned him respect and confidence from leaders around the world. Kerry has been chairman of the Senate Foreign Relations Committee for the past six years and has served on the committee since his election to the Senate in 1984. Kerry is also a decorated Vietnam War veteran and was the 2004 Democratic presidential nominee. Under the U.S. Constitution, the president nominates high government officials such as Cabinet members, federal judges and ambassadors with the “advice and consent” of the U.S. Senate. The Senate typically exercises its advice and consent by holding committee-level confirmation hearings in which senators question the nominee and discuss his or her credentials before issuing a report on whether to recommend approval by the full Senate. Once the committee’s report is issued, the 100-member Senate can discuss and debate the nomination and vote on whether to confirm. If a majority of senators votes to confirm, the nomination is accepted. President Obama said he is confident the Senate will quickly confirm Kerry. If that happens, Kerry will need to resign from the U.S. Senate, and Massachusetts Governor Deval Patrick would appoint a temporary replacement ahead of a special election that would be held between 145 and 160 days from Kerry’s resignation date. The president said that over the past four years his administration has begun “a new era of American leadership” by ending its war in Iraq, strengthening global alliances and standing up for human dignity around the world. “It’s fair to say that there are going to be some great challenges ahead. An uncertain world will continue to test our nation,” Obama said, but the United States is “safer, stronger and more respected in the world” as his second term begins. Kerry has played a central role in every major U.S. foreign policy debate for nearly 30 years, the president said. “As we turn the page on a decade of war, he understands that we’ve got to harness all elements of American power and ensure that they’re working together: diplomatic and development, economic and political, military and intelligence, as well as the power of our values, which inspire so many people around the world,” he said. If confirmed, Kerry will succeed Secretary of State Hillary Rodham Clinton, who had announced earlier in 2012 that she was stepping down from the position at the end of Obama’s first term. Clinton said Obama had made “an excellent choice” in choosing Kerry, saying in a December 21 statement that the senator has been tested in war, government, and diplomacy. “Time and again, he has proven his mettle,” Clinton said. Along with his experience in the Senate Foreign Relations Committee, Clinton said Kerry has been tasked by the Obama administration to “undertake delicate diplomatic missions and to deliver difficult messages” to foreign leaders. “As I have learned, being able to talk candidly as someone who has won elections and also lost them is an enormous asset when engaging with emerging or fragile democracies,” Clinton said, referring to the fact that both she and Kerry have unsuccessfully sought the U.S. presidency. Kerry would deliver “high caliber leadership” as America’s top diplomat, and Clinton said his experience is needed at a time when the United States is confronting crucial challenges such as the transfer of security responsibility in Afghanistan, nonproliferation, climate change and the promotion of human dignity and economic development around the world.